Noah Gragson and Cody Coughlin will lead the field to the start. John Hunter Nemechek will start at the tail, the team made unapproved adjustments. Bubba Wallace and Kyle Busch are the MENCS drivers in the field tonight. Wallace is on a 1 race deal with this team. Green, Gragson and Coughlin are side by side into turn 1. From row 2, Grant Enfinger looks to lane 3, Gragson pulls up to block the lane as the bottom line pulls off into the distance. Off turn 2, Gragson and Enfinger has a ton of speed built up from the high lane. They lost time on the entry to the corner, they’re making it all back. Coughlin pulls up to block the run from Gragson. The leaves the bottom lane open for Crafton. From 5th to 1st, in one corner, Crafton leads lap 1. Lap 5, Noah Gragson has a run on Crafton off turn 2. He looks to the inside, he wins the race to turn 3. Gragson leads lap 5. Lap 10, John Hunter Nemechek has climbed from the back to 10th! Lap 29, Kyle Busch has climbed to 2nd. He got loose early in the race and lost several positions, now he’s 0.4 seconds back of Gragson. Nemechek has climbed to 7th. 5 to go, Kyle Busch is now losing ground to Noah Gragson. He’s a full second back of the leader. Nemechek to 6th. Noah Gragson wins stage 1 at Kansas Speedway. The field hits the pit road. Gragson is first in and first off. Kyle Busch is -4 as the crew had issues with the right rear tire. Green, Gragson and Rhodes head side by side into turn 1. Gragson wins the battle on the outside off turn 4. Jordan Anderson is on the pit road under green. The hood is up on the pit lane. Lap 57, Gragson is weaving slightly down the back straight-away to break the draft. Rhodes can pull to his rear bumper by the end of the straights, then he’d lose ground in the corner. 15 to go in stage 2, trouble for Ben Rhodes! The engine is sputtering. He hits the pit lane from 2nd. The issues continue, Rhodes had too many men over the wall. Rhodes will serve a pass through penalty. 4 to go, Rhodes is no longer the problem for Gragson. However, the leader has a new issue in Brett Moffitt and Kyle Busch. The top 3 trucks are under a blanket as they race through lap traffic. The field is on the pit lane. Justin Haley wins the race off the pit lane with a two tire stop. Gragson smokes the tires from his pit stall to the pit exit line to be the first truck off the pit lane with 4 tires Gragson wins that race, by inches. Slow stop for Gragson. Green, Kyle Busch looks to the high side. 3 wide for the lead into turn 1. Haley is dropping like a rock through the middle. Kyle Busch runs a little high and has to get out of the gas as the dust flies into the air. Gragson leads out of turn 4. 73 to go, trouble for Brett Moffitt! He has to come down the pit lane under green. The crew goes to work to change the battery. 68 to go, caution for debris. 64 to go, the reen flag is out. John Hunter Nemechek gives a huge push to Gragson on the bottom lane. Gragson skates across the apron but catches it between shifts. A lap later, Friesen dives to the bottom in turn 3, he takes the lead. Bo LeMastus is sliding through the infield, the caution is out. Friesen hit the kill switch under caution! Friesen falls from the lead to 7th, under caution as he failed to maintain pace. The shifter ball fell off, when trying to get it, he hit the kill switch. Green, lots of bump drafting. Friesen is 3 wide and flying to the front. 7th to 2nd in one lap! Gragson leads. 34 to go, Gragson hits the pit lane. Green flag stops are underway as Friesen is passed the lead. 30 to go, Stewart Friesen hits the pit lane, two tires! 29 to go, Kyle Busch is on the pit lane from the lead, two tire stop for Busch. Johnny Sauter leads, he plans to stay out for as long as possible. Kyle Busch looks high on Friesen, he pulls up to block. Kyle dives to the low side, Friesen cuts down as well. They make light contact and Busch slides to the apron, he saved it! That’s a battle for 7th. Gragson runs 9th. Gragson was 4 seconds behind Friesen and Busch. Sauter still leads, the top 6 cars haven’t pitted. 16 to go, Sauter pits from the lead, fuel only. Myatt Snider leads. 11 to go, Friesen, Busch and Gragson run nose to tail. Gragson dives to the inside of Busch, he takes that position. Gragson has a run on Friesen off turn 4, another easy pass for Gragson who took 4 fresh tires. Busch slips around Friesen as well. 8 to go, Gragson moves around Bubba Wallace for 2nd. He’s 3 seconds behind Myatt Snider. 5 to go, Gragson is on the back bumper of Snider, he’s out of fuel. Snider missed the pit entry. He’s going to have to coast for a full lap. Bubba Wallace and Austin Hill are out of fuel as well. 1 to go, Gragson leads Kyle Busch by 1.5 seconds. 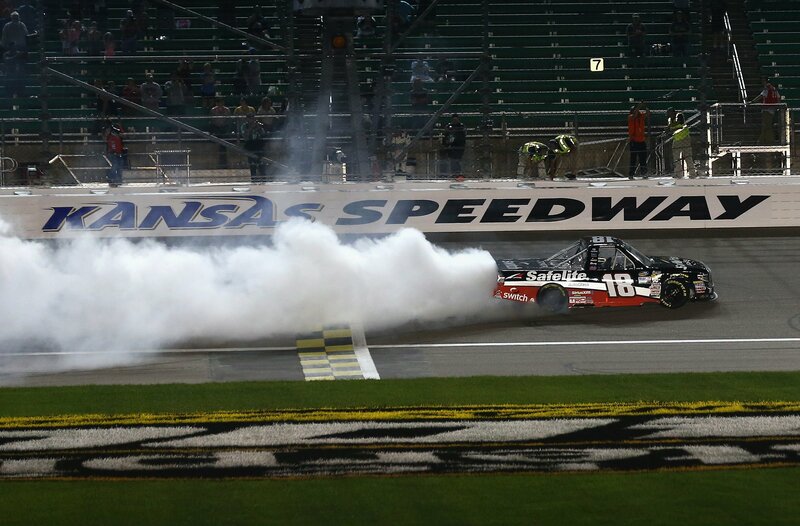 Noag Gragson wins at Kansas Speedway! View full NASCAR Truck Series race results from Kansas below.